This was started on New Year’s Day and then it got put down and buried under stuff. I am sat here feeling slightly obfuscated, mostly due to schnapps, brandy and presecco seeing out the old year. 2016 was a year that a lot of interesting and clever people shuffled of this mortal coil. The way East/West politics are moving 2017 could be the year that everyone dies. I didn’t paint much, far less than I wanted to. The Dragon was prevaricated on. It seemed that every time I picked it up I was asked for help with something else so there was no “Zone” achieved. But there shouldn’t be too much beating myself up. My workshop is set up and I can airbrush to my hearts content. One project for this year is to make a spray booth with PC cooling fans (from the recycling center) to extract spray. The hobby room is done, bar one small speaker shelf. So I have my space for painting and gaming. And I have been working on the garden making a path and building a wall. This involves going to the farm with a wheelbarrow and taking a rock and wheeling it back, so quite time consuming. Financially the laser cutting has not been a success this year. Etsy resulted in zero sales. Handing out my business card at Salute resulted in a huge spike in blog views the following day, but zero sales. What I find frustrating in my target audience is that they will happily fork out thirty or forty quid for one figure they owned as a teenager but will balk at paying twenty for scenery to grace their collection. There was a thread I was following where collectors were boasting about the prices they had paid for a metal Thunderhawk Gunship. It was jaw dropping. I am going to continue with making laser cut scenery, if only for myself. But getting some money for it would be nice. The last year has seen a readjustment in family finances. I have gone from having a huge disposable income a couple of years ago to having none. My Wife stopped working at the beginning of last year and despite having no income we’ve lived comfortably. Having no rent or mortgage helps tremendously and visiting fleamarkets for clothes and entertainment makes what we do have go along way. I have backed a few Kickstarters this year, not as many as I would have liked. Ten Minute Heist and Dwarves in Trouble are two board games that look like fun to play with the Boys. 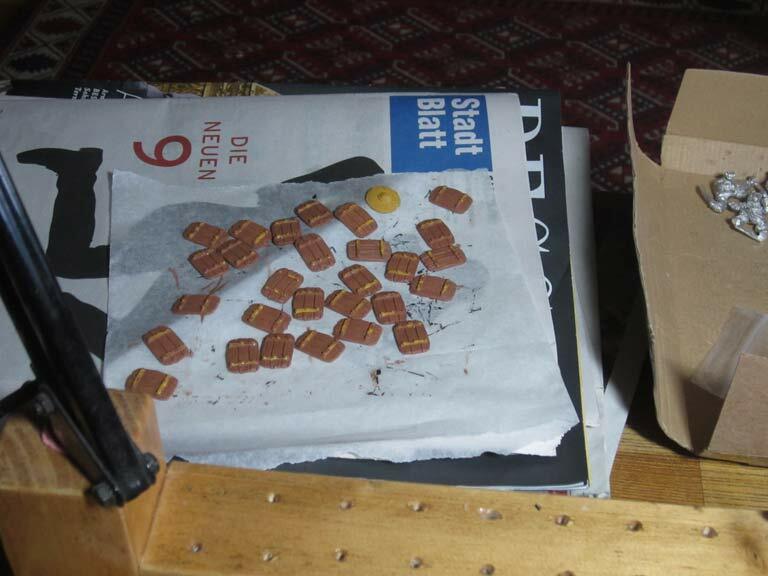 Then came the addiction, miniatures. Space Raiders, scifi orcs sculpted by Kevin Adams. 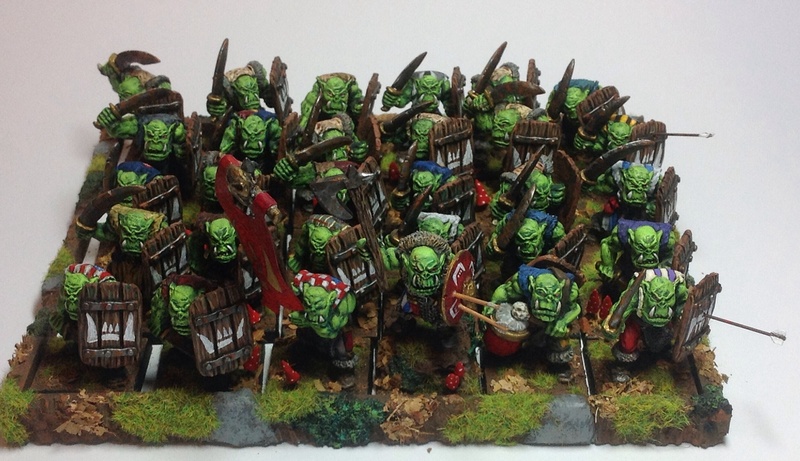 Greenskin Wars, goblins sculpted by Kevin Adams. Goblins and Sea Demons, sea goblins sculpted by Kevin Adams. Return to Colony 87, scifi civilians. Kev White does Matt Dixon, female fantasy miniatures. And finally Ramshackle Games’s Jetbikes. The product of the year for me has been Foundrys Sable Mix General Detail Brush. I was going to replace it at the beginning of the year but it kept on going for “one more paint job”. In fact it is still going strong, so I might not replace it just yet. Although I’m not very good with my predictions I’m going to say that 2017 will be the year of NMMs. 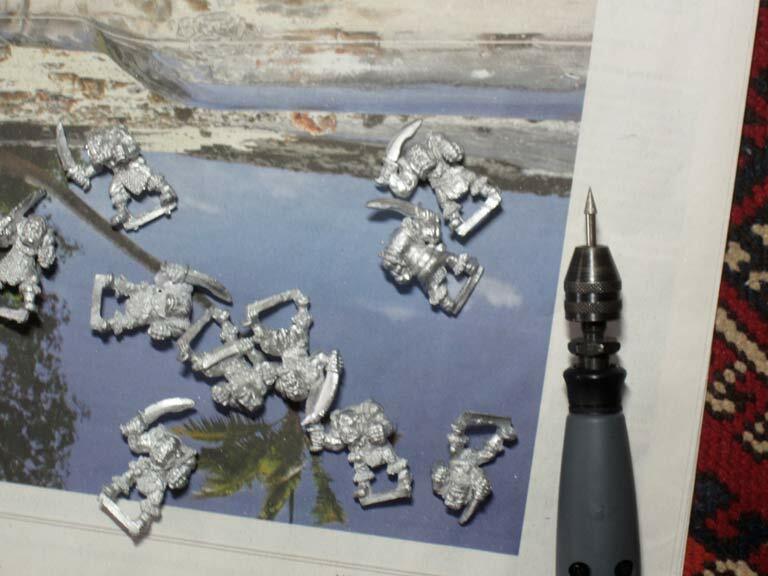 Non Metallic Metallics, where you paint something to look shiny and metallic without using any metallic paint. For those of you who don’t quite get what I’m on about, think about a photograph of a shiny teapot. 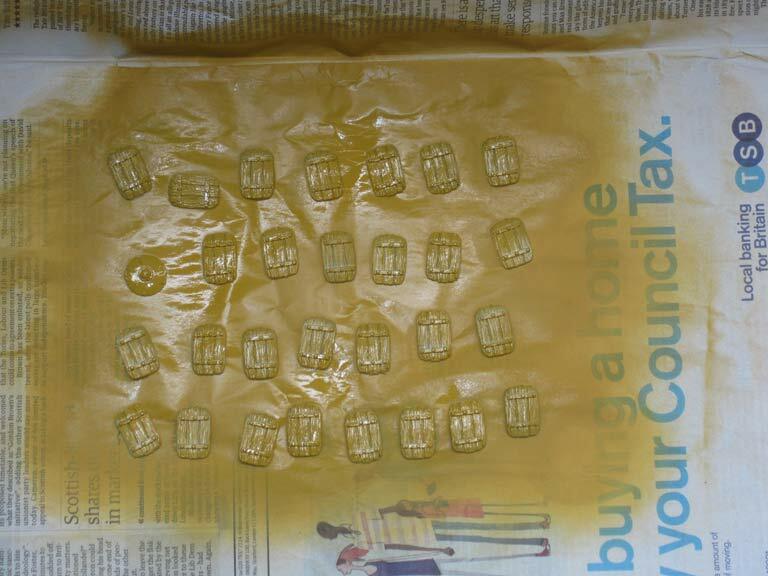 You don’t have metallic inks when you print a photograph. What you see are whites, greys and whatever background colours are being reflected. So the object is to try and replicate this without metallic paint. G’Dub is already putting painting guides out with this technique with some of their new products. Talking about G’Dub, I have liked watching their Warhammer TV on Youtube. It has been very instructive and has kept my Boys entertained. Just remember kids, always thin your paints. Something I got as a Christmas present was a copy of Osprey’s Rogue Stars ruleset. It is a bit dry, mostly tables of equipment, physical traits and very little fluff. From reading of reviews apparently one gets the hang of it very easily. The advantage, as I see it, of having very little fluff is that you can create your own universe in the flavour you want. Magrathea anyone? I’d like to make a go of this and try and run a demo game at the Austrian Salute this year. The game is figure light, four to six figures a side and the playspace is three foot by three foot. So I have approximately ten weeks to learn the rules. I’ve taken the step of joining the Austrian gaming forum, diefestung, to find opponents. 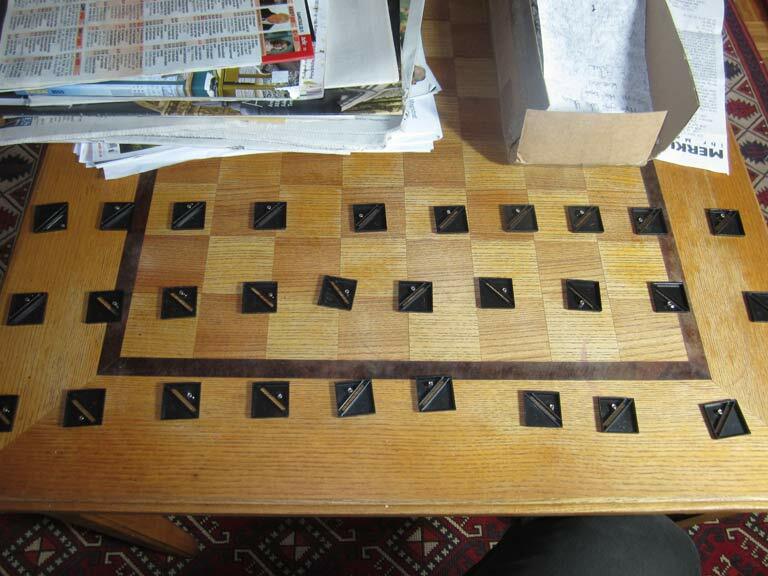 Then painting the figures and making a terrain board which will showcase my laser cut work. Oh, and make sure I have enough stock to sell. Speaking of stock I must really extract my digit and design more big objects. The ideal solution would be one big thing a month. This year I must be more focused on my painting. First jobs are to finish off any jobs that haven’t been completed. Then I need to decide which army to concentrate on and finish it. A prime candidate would be my Roman army, just a fortified camp and two commanders. This is a topic I’ve been having some problems with. Now things are starting to settle down a little with the house I thought it was time to get a little consistency with my model pictures. 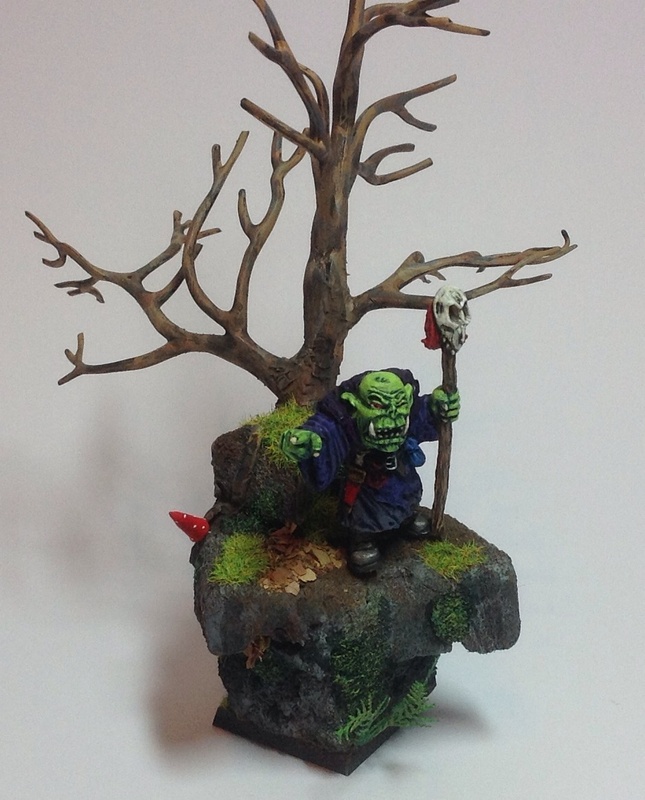 There are a couple of blogs that I occasionally look at where their models are photographed with a scenic base and background and I quite liked it. The base was a square of polystyrene with some blue foam details. 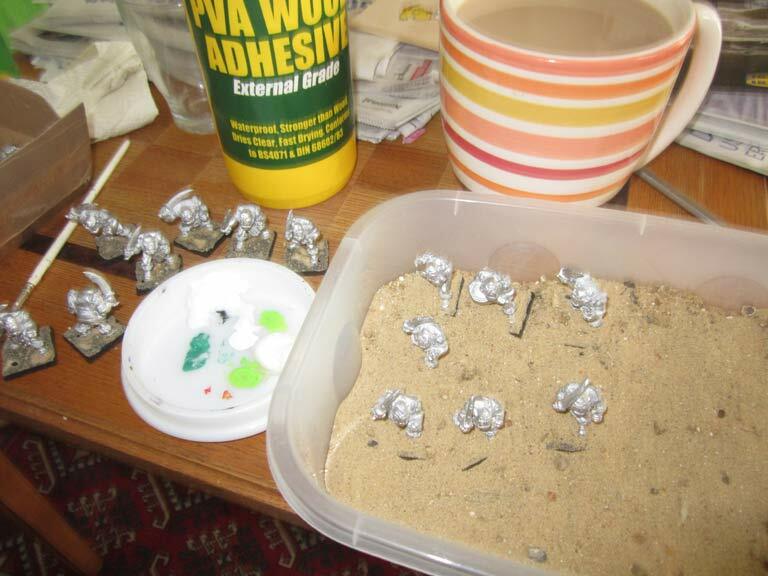 This was then coated in PVA glue and coarse sand added for texture. This was painted with some dark brown household emulsion paint. Then it was drybrushed with two more colours of emulsion. I went a little low-tech with the sky backdrop. I used a diffuser tube, a kind of crude airbrush, figuring that the coarse splatter wouldn’t be seen. On the reverse side of the sky backdrop I made a chaotic mix of colours. My main problem was that the card was not dimensionally stable and warped like mad. So I had to dry it like this. Here is my set up. My camera is a Pentax istD. I went down the Pentax route as I have a large number of Pentax lenses from my time as a photographer in the Eighties. The soft-box and lights are from an eBenk WSB-342 studio kit that I bought for this purpose. The one thing I have done is to change the bulbs to LEDs as they don’t run as hot and don’t use as much electricity. Here is the first attempt. The lights give a yellow cast, I haven’t as yet managed to source daylight bulbs, the white balance in camera is set to “Tungsten” and but a bit of tinkering in Photoshop (minimal, one slide of the colour balance) solves this. Some trees in the background. So far the problem with this is the depth of field. There is far too much of it. So I dropped the aperture right down and this is the result. There are some very minor adjustments to be made, but I think I’m pretty close. Now to write down what I have done so I can continue to be consistent. The model used for photography is from Ramshackle Games. What Kevin is upto. This may be a Kickstarter next year. Here is the finished unit of the Lancer Miniatures Orcs from their recent Kickstarter. A very good price and an Old Skool vibe. Twenty different poses, so a unit looks varied. A couple of the sculpts appear to be phoned in. The Slottas could be a little thicker to grip the base better. If I had the money I would support further Kickstarters from Lancer. The more they do the better they’ll get and that’s good for all of us. It would be good to see the sculptors take on Trolls. Oooh shiny! So much for discipline! There I was, being disciplined in my painting, and along come the Orcs from the Lancer Miniatures Kickstarter. So what happens? I stop painting what I was doing and start these. 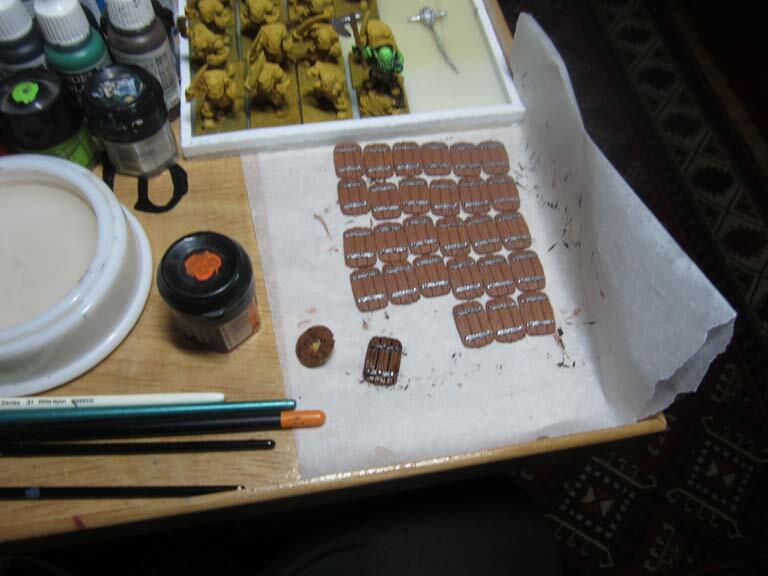 Here is a view of my production line. 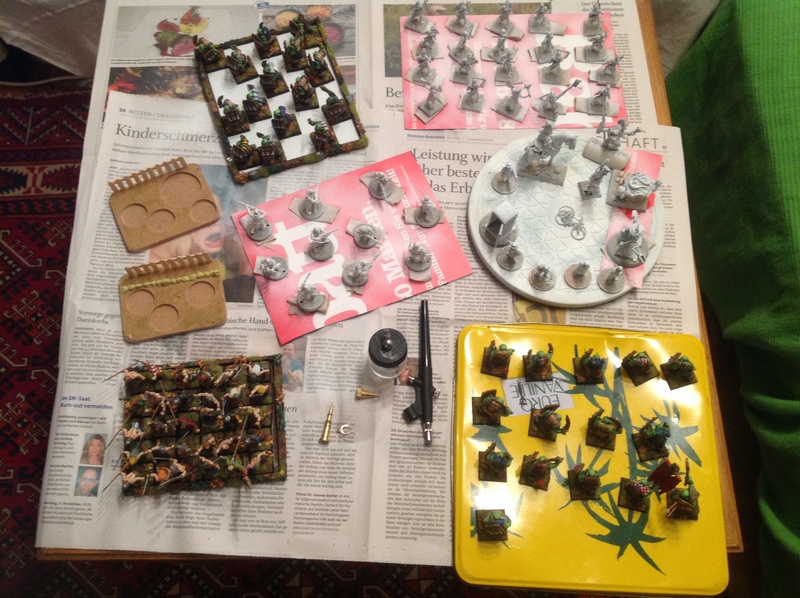 This is pretty much what I do when I have a unit to paint. 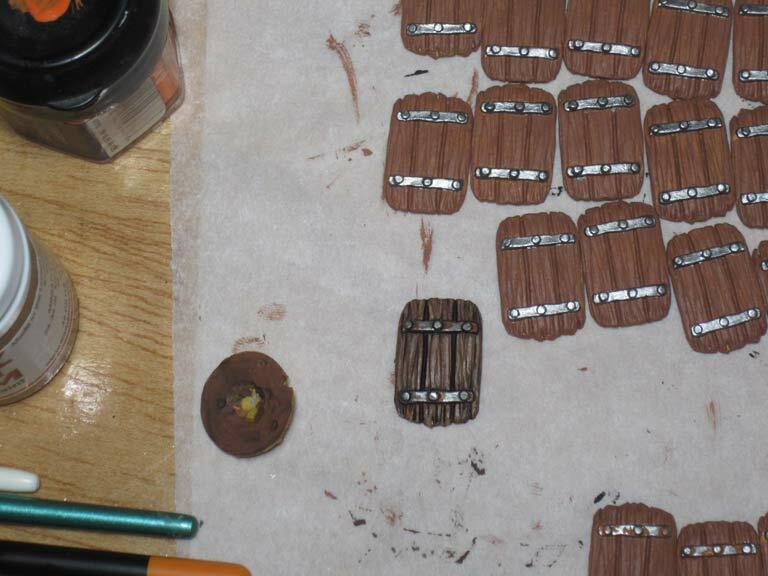 Undercoating the shields. I’ve been a bit lazy and used an old can of yellow primer that I had lying around rather than using my airbrush. Metal painted. A test shield with wash and in the background you can see the beginnings of a movement tray. Test shield with rust, wash and wood highlights.